Conceived in 1993 by four friends, Boys Life became known for passionate and dissonant guitar-driven rock with DIY roots and a distinctly Midwestern sound. They sought to make the kind of music they wanted to hear and in the process created something uniquely their own. By 1995 they released their self-titled debut and toured the underground scene in nonstop support of their work, playing everywhere from basements and coffee shops to Gilman Street with bands such as Knapsack, Giant’s Chair, and Christie Front Drive. The following year brought further collaboration with Christie Front Drive in a split 10”. With a growing fan base in an emerging genre, they were ready to create their second album, Departures and Landfalls. While on tour, the band became a tighter unit and developed focus by talking about music and planning their future creative direction. They all saw Departures as their first opportunity to document new songs that could help define an original sound. With stronger songcraft, a refined tone, and a solid creative process, the work they created remained abrasive but also incorporated warmth and depth. Geography and seasons affected the process; some songs were written on the road, with an ever-changing landscape, and many during the springtime and early summer. Late nights of long drives, longer talks, and doing what you love are what made Departures Boys Life’s first real record, full of new but classic sounds. They had made something of their own. During five days of a hot summer in Chicago in 1996, they recorded with Bob Weston in the home studio of Steve Albini. In the band’s maturity, they were rehearsing almost daily and decided to record the album live. Several first takes made the final cut, and the resulting songs sounded natural and organic, reflecting the true dynamic of the band and their live performance. 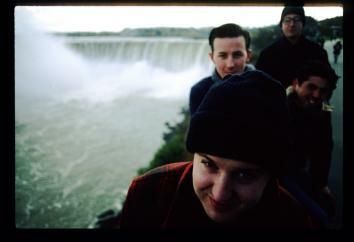 After the record’s release, Boys Life co-headlined tours with Kerosene 454 and Bluetip. Their performances were loud, enthusiastic, and genuine, and the experience strengthened the band’s newfound bonds with those in DC sharing the same postpunk ethic. By the end of that touring cycle, however, citing exhaustion, they called it a day in the summer of 1997. Now, nearly twenty years later, Boys Life is ready to revisit their records with renewed energy. Both the band and their songs were products of a special time that can’t be replicated, only revisited. But then and now, both Boys Life and Departures and Landfalls reflect something more than nostalgia—creativity, the power of music, the roar of a thunderstorm, and the lonesome sound of a train whistle.